Civil works are often constructed far away from the populated areas. Tunnels, bridges, energy plants etcetera are often build in areas where housing for the construction work force is usually not nearby. Or if there is housing, the local communities do not have the bed capacity for the large labor force required to build such projects. Therefore a lot of time is lost in travelling or alternatively a land camp must be build. 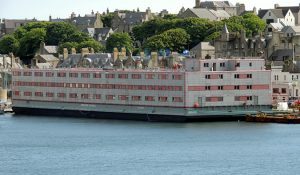 For these projects Chevalier Floatels offers the ideal solution, our accommodation barges. Our barges are existing floating buildings that can be made custom fit for our clients. Standardly equipped with large kitchens, restaurants, recreation areas, offices and laundries they cater for every need of the modern construction worker. And as they are readily available, they can be employed at very short notice. 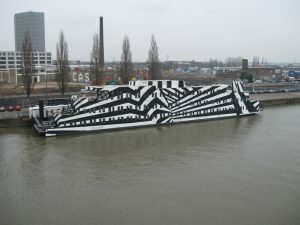 The barges are towed to the site, connected to the shore and your accommodation camp is ready to begin. In case of construction of coastal highways the barges have another advantage. As the road progresses, the barges ca move along with the project, reducing time needed for workers to travel to the construction site. Kalmar, a 220 room hotel suited for up to 680 persons. 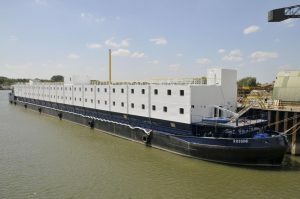 Rossini, a 110 cabin barge suited for up to 440 persons and especially build for extreme environments with an operational weather range from -36 degrees to + 40 degrees.